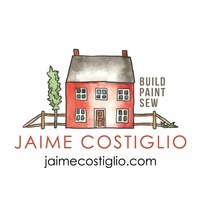 Jaime is a DIY project enthusiast who writes the self-titled blog, Jaime Costiglio, which focuses on building, painting and sewing. She builds, paints and sews just about everything in true DIY fashion and posts her projects in a tutorial format to share the experience with readers. Blogging for 8 years now Jaime has amassed quite a collection of projects however 3 years ago she moved her family into a 1740 saltbox farmhouse which has become the biggest project of all. Her home is truly a treasure and a diyers dream, she is the caretaker of history and at the same time able to leave her mark! Jaime says the most wonderful thing about living in such an old house is that the projects keep on coming, which means she will be building, painting, and sewing for a long time to come. Jaime lives just outside New York City in Westchester County, New York with her husband and three children. What a clever project. Road trips just got WAY more fun for kiddos with this lap desk! Jamie, this is really a great project, I am just about to build it out for my pumpkin. Love that it is multi funtional for both car riding or even at home. Thank you for sharing the plans. Love your work. Thank you Jamie, I did create a lapdesk earlier, but these modifications really help make my munchkin happy. Is it possible to have the cut list detailed, properly since most of the left side seems to have trimmed. This is such a fun way to hold candy - either on the porch or inside in the hallway! That's so clever! Great job and I bet the kids love it.